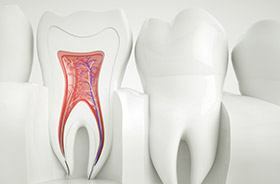 If the vulnerable tissue within one of the teeth has become badly damaged or infected, a root canal procedure may be the best option for replenishing its health and helping patients avoid the need for extraction. Many people have heard scary stories about root canals, but these reports are greatly exaggerated. In today’s world, root canals are highly-modern and only minimally uncomfortable – most patients compare it to getting a small filling. Why Choose Torrington Dental Care for Root Canal Therapy? During this procedure, your dentist will carefully remove the soft tissue inside the tooth (also known as the dental pulp) with special instruments. Then, the empty void is filled with a biocompatible replacement before the area is thoroughly sealed to prevent further damage. As a final touch, the structure will be restored with either a filling or a custom-made dental crown. While there may be some mild sensitivity in the days following the procedure, it will be nothing compared to the serious oral pain you were experiencing before. If you suspect that you may need a root canal, don’t hesitate to contact Torrington Dental Care today for help.